Appropriately coordinated expression of genes is essential for normal cell growth, development and differentiation in all organisms. The control of expression of many genes in eukaryotes occurs at the level of transcription. The central objective in our laboratory is to achieve an understanding of the molecular mechanisms involved in transcription of the ribosomal RNA genes, mediated by RNA polymerase I, and the cellular control of this process. 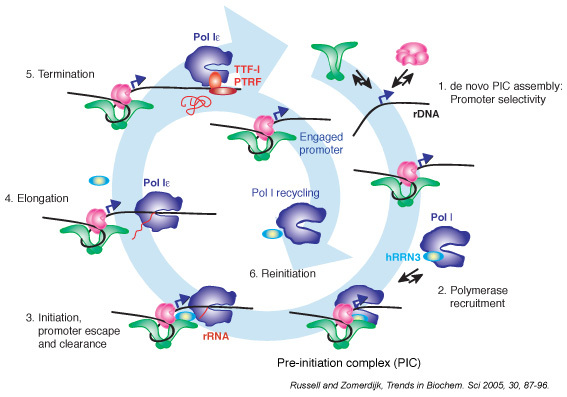 rRNA synthesis drives ribosome biogenesis and, therefore, is associated intricately with cell growth and proliferation. Deregulation of this process can lead to cell death, hyperproliferation or hypertrophy and has been linked to specific cancers and heart disease. (Numeracy and Data Interpretation assessments) and 4 lectures (from Aug 2015). lectures/tutorial sessions and 1 workshop and 1 essay assessment.